Learn about ancient Mayan culture, marvel at natural wonders, and get your adrenaline pumping on this 3.5-hour Emotions Native Park Adventure from Playa del Carmen. 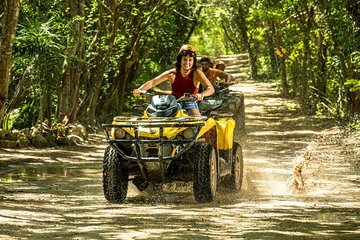 Ride through the jungle on an ATV, soar through the trees on a zip-line, swim in a cenote, and take part in a traditional Mayan blessing ceremony. A typical snack is included. Make your own way to the Emotions Native Park in Playa del Carmen for your selected departure time. After meeting your crew and listening to the safety briefing, get suited up and set out to explore the jungle. Go through jungle paths for one hour enjoying the natural beauty of the park. Cross a bridge over a cenote, view Maya ruins, and brave a walk across a treetop suspension bridge. Grab a snack, and then go to the Cenote de la Luz and learn about the formation of cenotes, stalagmites, and stalactites. Soar through the jungle on a zipline and cool off with a swim in the stunning Cenote Media Luna. Take the time to shower and change before making your own way back to your hotel. People under the influence of alcohol or toxic substances won’t be allowed to participate. Maximum weight – 264 lbs. For safety reasons, at Emotions Native Park, using cameras and recording devices of any kind (including cell phones, or tablets) are not allowed, except for "action cam" (Go Pro) style, only if it is assembled on a chest or head mount during the excursion. but overall was just great. Great experience! Ziplinig for the first time but we felt very safe as everything was explained and there was no rush. There are three lines alltogether so after feeling a bit scared and stiff on the first line, you then have a chance to enjoy it little bit more for the second and third time. ATV's were fun and driving track wasn't monotonous and ride lasted just long enough. I would recommend to bring some scarf to protect your mouth/nose from dust as we expected to be given one since it's a very dusty drive and unfortunately we were at the tail. You will be provided with goggles though. Swimming in a cenote was a lovely refreshment and towels are provided to dry yourself afterwards. Life jackets/ goggles are available as well. Giacomo was very friendly and kept it all fun. They'll take plenty of photos of you whilst you're doing these activities which you can purchase at the end. We would definitely recommend this adventure. The ATV and ziplining was absolutely fun.